In the library at Friends Seminary on Manhattan’s East Side. The school has about 700 students. When tensions rise at a Quaker meeting, the room is immediately brought to silence — the Quaker form of worship. In recent New York gatherings, when the subject of Friends Seminary comes up, there has been a lot of quiet. 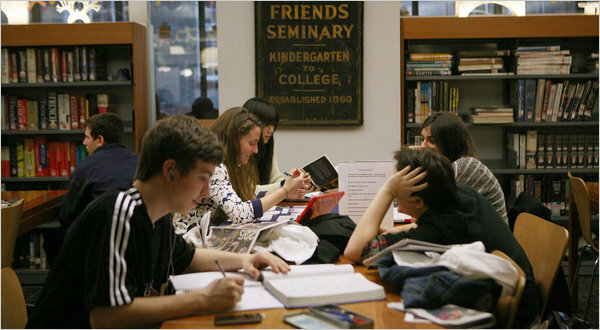 Friends Seminary in Manhattan charges $32,870 tuition. The issue that has hushed the Quakers’ 19th-century meetinghouse near Union Square is whether the church and school, joined for 225 years, should formally part ways. There are legal advantages to a split. But some church members are also pushing for the separation because they say the school is no longer really Quaker. Among other complaints, they say the school’s $32,870 tuition, selective admissions and private-school culture fly in the face of the signature Quaker credos of simplicity, openness and equality. “There are a number of Quakers that are concerned, who believe that the school over time has become a rich kids’ school,” said Michael Schlegel, the leader of the trustees of the New York Quarterly Meeting of the Religious Society of Friends, the city’s chief Quaker body. Other secular schools in the city have relationships with religious institutions, but the Quaker meeting, or congregation, and Friends Seminary are especially close. They share buildings, some members of the school’s governing committee come from the meeting, and at least for now they are legally unified. Over the past three decades, a number of Quaker meetings around the country have separated from their schools, often for liability reasons. Brooklyn Friends School did so last year. Perhaps the most prestigious Quaker school in the country, the Sidwell Friends School in Washington, where Sasha and Malia Obama are students, has been on its own for more than 75 years, but a majority of the schools’ trustees are Quakers. 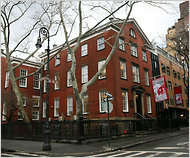 Friends Seminary, established in 1786 for children of Quakers, uses several picturesque town houses, as well as the Quaker meeting hall on Rutherford Place between East 15th and 16th Streets.